Prevents charge build up with a precise constant current. Brief pulses of electricity are used in various biomedical research applications as a stimulus to excite nerve or muscle fibers. Several factors need to be considered when choosing the right stimulator. The DS3 provides a precise Constant Current stimulus (up to 32mA) controllable in Pulse Duration and Amplitude and as with the DS2A this output comes from self-contained batteries. The DS3 also features a “clamp” or discharge circuit which discharges the output between stimuli, preventing a charge build up on the preparation. In other constant current devices this charge build up can lead to a loss of stimulus. 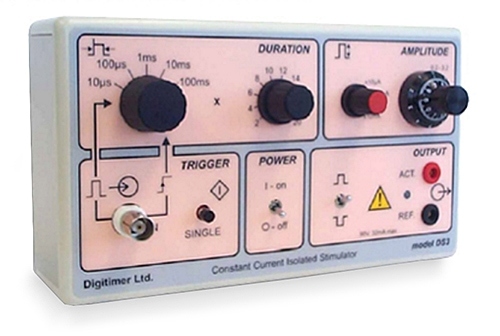 The DS3 can be triggered by an external device such as our new DG2A Train/Delay Generator. NOTE: This stimulator is NOT approved for use on human subjects. Four current ranges allow precise control of output between 2µA and 32mA. Output discharge (Clamp) circuit prevents capacitance build-up during stimulus trains, which is important to prevent stimulus loss. Accurate and reproducible stimulus characteristics. Switchable polarity, variable output and duration ranges (20µs to 2s). External pulse duration control through the BNC trigger input. A single-shot button, which operates irrespective of trigger inputs. Cases manufactured from insulating material may be rack mounted using an optional mounting frame (Model D121-11) available from Digitimer Ltd.